Located on the Langford Colwood border, the Westshore Urgent Primary Care Centre is a Primary Health Care Centre designed to provide a range of services in one central location. The goal of the centre is to provide same-day access to team-based primary care delivered by physicians, nurse practitioners and registered nurses, with access to mental health and substance use clinicians. Please check www.Medimap.ca for wait and closing times. The centre may have earlier closing times due to high patient volumes. Is this the right care location for you? The Westshore Urgent Primary Care Centre is not an emergency department. For all emergencies or life threatening conditions, please call 9-1-1 or go to your nearest emergency department. Some decisions are straightforward: If your car needs repairs, you go to the mechanic. If you need a haircut, you go to a barber or hair salon. But when it comes to healthcare, the choice is not always so clear. Doctors' or Nurse Practitioners' Office: Your primary care provider should be your first call in non-emergency situations. Your provider knows you and your health history, including what medications you are taking and what chronic conditions might need to be considered in your treatment. Same day appointments may be available - ask your provider. If your provider is unavailable, try a walk-in clinic or Urgent Primary Care Centre (UPCC). Call 8-1-1 for trusted health advice at HealthLink BC. Walk-in Clinic: If you have an illness that is not an emergency – like a sinus infection or skin rash, minor sprain or strain – and you cannot get in to see your primary care doctor, you can seek treatment from physicians at your neighbourhood walk-in clinic. For locations and wait times, visit www.medimap.ca . Urgent Primary Care Centre: If you have an illness or injury that you need to have looked at within 12-24 hours, but it’s not an emergency, these centres offer same-day, team-based care provided by doctors, nurse practitioners and registered nurses on a walk-in basis. Many urgent care centres also offer extended hours and are located near mental health and substance use services, medical imaging and laboratory services. The Westshore Urgent Primary Care Centre offers same-day, team-based, primary care. 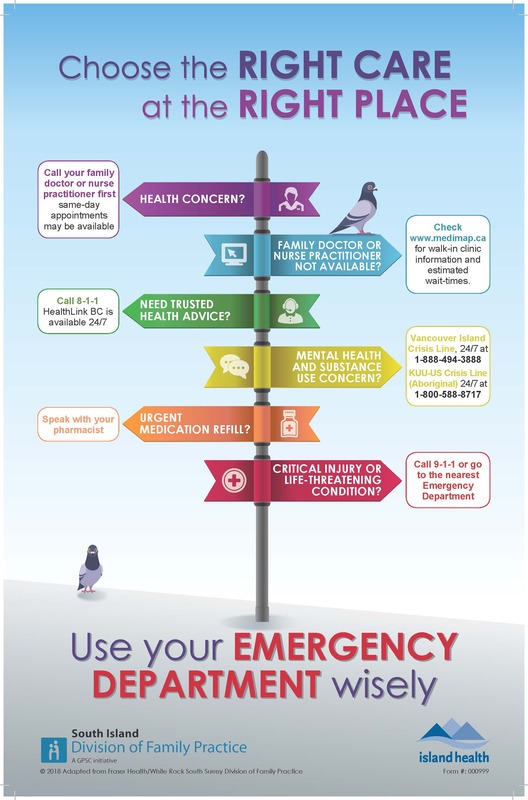 Emergency Department: Emergency departments are designed to treat urgent, acute and life-threatening conditions and aren’t the place for routine care or minor ailments. If you feel you are dealing with a health emergency, call 9-1-1 or go to your hospital emergency department right away. Otherwise, one of the above options will save you time and clear the way for patients in need of emergency treatment. Still unsure of where to go? HealthLink BC offers 8-1-1, a free provincial health information and advice phone line available for residents of British Columbia. By calling 8-1-1, you can speak to a health service navigator, who can help you find health information and services; or connect you directly with a registered nurse, a registered dietitian, a qualified exercise professional, or a pharmacist. Any one of these healthcare professionals will help you get the information you need to manage your health concerns, or those of your family.